Hainanese chicken rice is widely regarded as the iconic dish of Singaporean cuisine. It actually originated from Wenchang on Hainan island (therefore the name), but popularized both in Malaysia and Singapore. Making the dish using the traditional method takes a lot of work. You are required to use a whole chicken cooked under low heat in a pot of water. The chicken is also chilled afterwards so that the skin becomes more more firm, with a jelly like consistency. The rice has to be flavored perfectly with oily, flavorful chicken broth (made from the liquid used to cook the chicken). 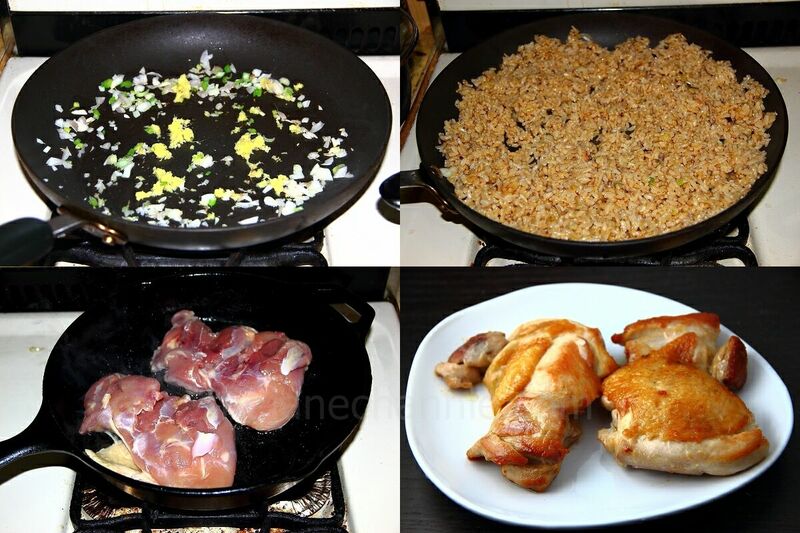 The chicken is chopped into pieces and typically garnished with cucumbers and peanuts. A dipping sauce also needs to be prepared. All this takes a huge amount of time that just isn’t practical at home. If you love Hainanese style chicken but looking for a recipe that doesn’t require spending too much time in the kitchen, this recipe found on Sing Tao Daily may be what you are looking for. It’s a simplified version of Hainanese Chicken Rice that can be made even on week night. The goal is to really cut down on the process, but still maintain the flavor profile of the dish. The major difference between the original Hainanese chicken is that instead of cooking a whole chicken in a water, we pan fry the chicken thigh for a crispy skin. Marinate the chicken with wine, salt and pepper for an hour. Heat oil in a skillet over high heat. Place the chicken on the pan (skin side down), sear for couple minutes until the skin is browned. Then flip to the other side and cook until no longer pink and juices run clear. Let the chicken sit for 10 minutes before cutting into strips. Meanwhile, heat oil in a skillet over high heat. Stir in ginger, scallions and shallots, cook until fragrant. Add brown rice and chicken broth. Cook until the rice absorbs all the chicken soup. 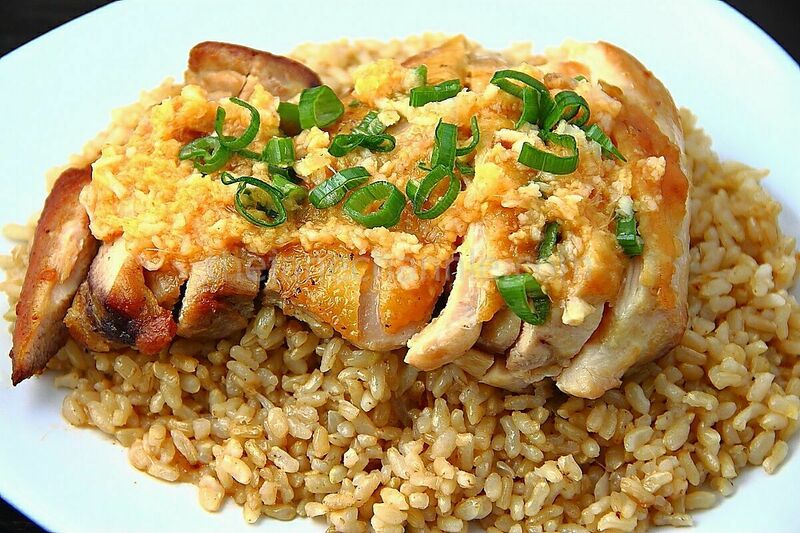 Serve chicken with the sauce over brown rice. I also like to dip the chicken in sweet soy sauce.